I have finished knitting Davey’s sweater. I finished it just in time for the really cold weather that has arrived. 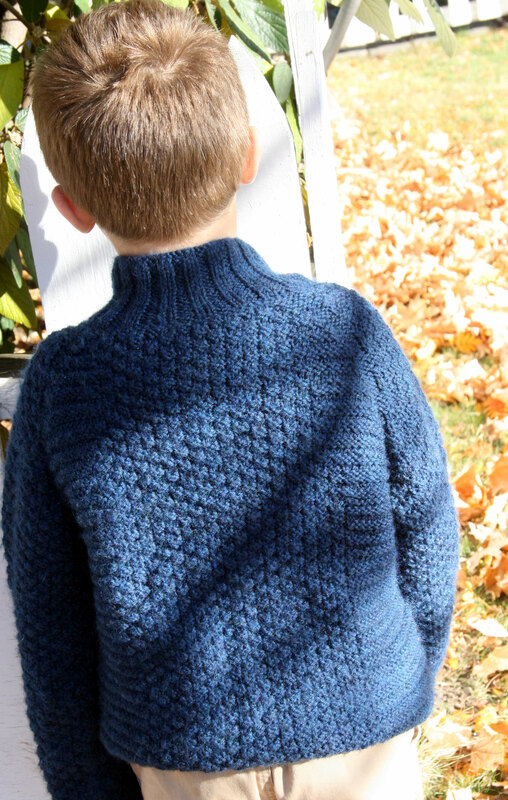 The sweater pattern is called Wyatt and is from Brooklyn Tweed. I used a superwash yarn from Ella Rae. 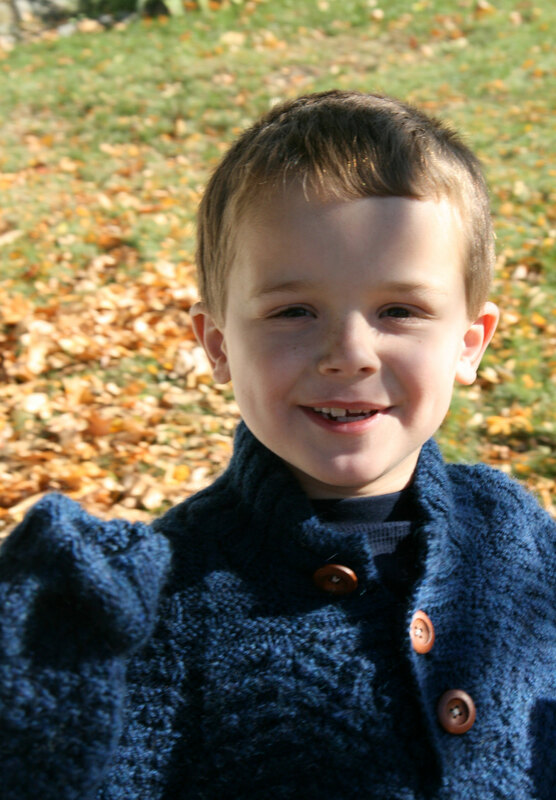 Davey very agreeably consented to let me take some pictures of him in his sweater despite the busy day he is having playing Minecraft (“Mama, I am relaxing!”). The light is not perfect, but we got some nice pics anyway. There were a couple of challenging moments with this sweater. I knitted one of the button bands and totally messed it up. 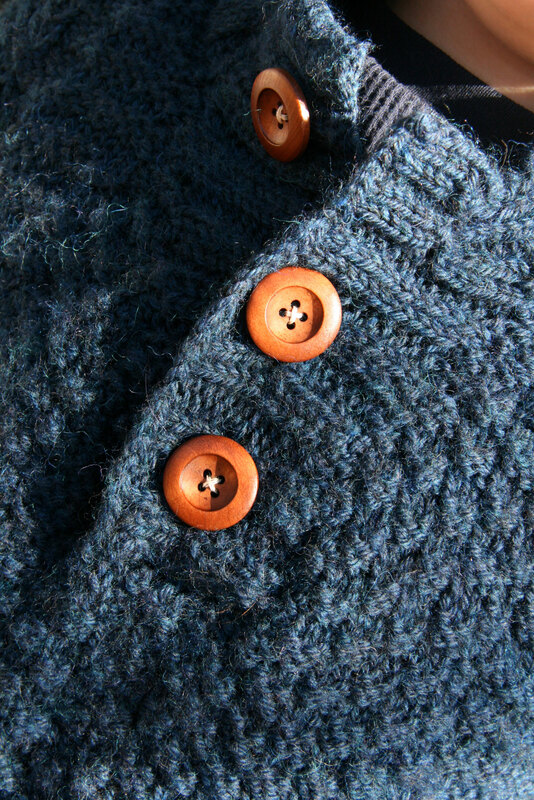 I didn’t pick up enough stitches when I was making it so it came out a lot shorter then the opposite button band. I think the sweater went into time out for a little bit. The second time around, I still didn’t get it quite perfect, but it went much better. I ordered some beautiful buttons from an etsy seller called AnnyMay Craft Supplies. I love these buttons. I did something earlier on too when I was trying to figure out how to incorporate the sleeves into the body. I have kinda blocked the specifics out of my mind. This resulted in another time out. Then there was also a moment where I thought the sweater would end up being mine. I soaked it and then lightly blocked it. After I blocked it, I thought “wow, that sweater looks really big,” but I thought “nah, it will be ok”. So I came back to it when it was almost dry and it definitely was enormous. I should have taken a picture. I had a feeling that it would fit me. I tried it on and it fit almost perfectly. A size 8 boy’s sweater. I messaged my friend Ann. She told me not to panic. She explained that superwash wool stretches like crazy, and that it really needed to be dried in the dryer. I got it wet again and put it into the dryer. I was worried that it would either not shrink up enough or shrink too much, but after it was dry, it was back to the right size which is one that has some growing room. It should easily fit him next winter I am hoping. It’s apparent in this picture that the sleeves are a little long still. Davey was very helpful. He said I needed to take a picture of the back of it. So I did. The light was too bright here, but I loved how Davey modeled the sweater for me when he was standing on the front porch. I learned a lot making this sweater, and it definitely had some challenging moments. But – yay! – it turned out well. 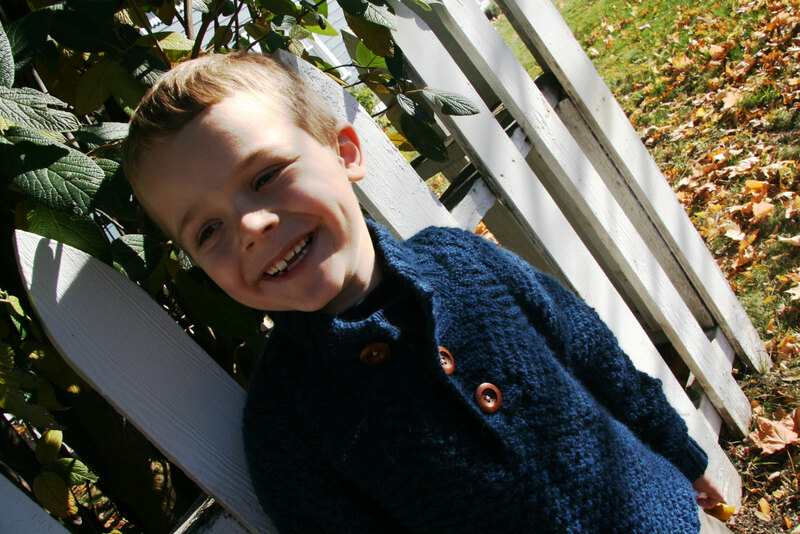 This entry was posted in Knitting and tagged brooklyn tweed, Ella, Wyatt, Yarn Folk by cpeezers. Bookmark the permalink. That is a beautiful sweater! Lucky Davey. Beautiful sweater. Love the pattern and color. It looks great on Davey. Such a gorgeous sweater! 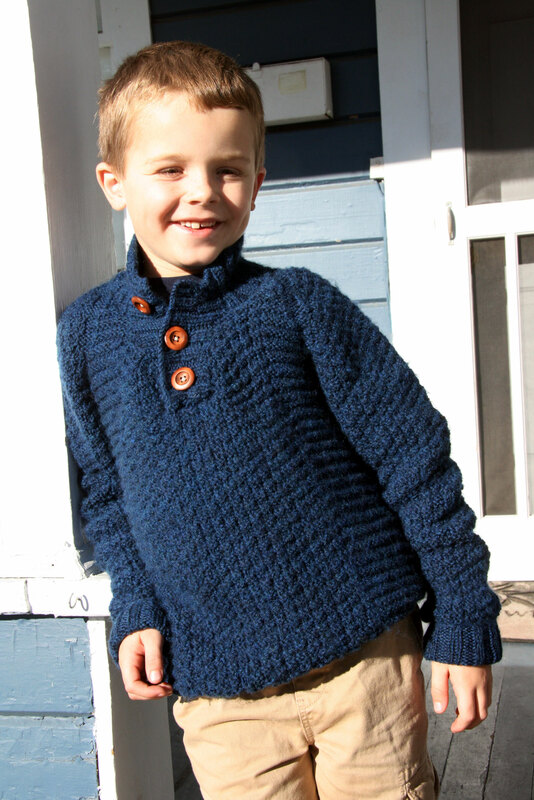 I love the BT Kids pattern collection and must knit one for my own little kniwear model. Davey looks like he loves posing for the camera!